Coffee, the nonalcoholic drink of guilty pleasure, has for a long time been demonized. In recent years, however, nutritional data has surfaced that reverse much of these long-standing results and affirm that coffee no longer needs to be shamed. But there are some catches. Here are 8 things from nutritional science to consider. This is the reason most people drink coffee, and the best evidence is to note how it gets you through the workday. Can you imagine functioning without it? The caffeine in coffee is what’s responsible for increased productivity. "Coffee provides the highest proportion of antioxidants in the diet of the populations of some European countries, including Italy, Finland, France and Spain." Caffeine has important effects on alertness, and there is no doubt that caffeine is widely consumed by subjects who need to stay awake.”  Additionally, another study concluded “that caffeine enhanced consolidation of long-term memories in humans.”  There are even greater effects for short-term memory. “Caffeine may improve working memory and retrieval from semantic memory. These effect sizes are usually smaller than those found using selective and sustained attention tasks. Similarly, it is unclear whether the effects are really due to changes in memory or just to a change in the speed of encoding the information.”  These changes occur indirectly. By increasing alertness and concentration, caffeine temporarily increases memory encoding time, which is why so many people drink caffeinated beverages like coffee before work or exams. Note that because caffeine is responsible for increased stimulation, other beverages give the same benefits. Caffeine is naturally found in many plants. In addition to the coffee bean, the cacao bean, yerba mate, and tea leaves also contain caffeine. One thing researchers demonize coffee for is the detrimental effects it can have on sleep. This is flip side of increased productivity. But being wise in choosing when to have your coffee minimizes this risk. “Parallel to the circadian arousal rhythm, human performance shows a trough for most cognitive skills during the early morning hours.”  Cortisol and other hormones that keep you alert naturally dip during this time. Another time they drop is during early afternoon. “Another time of day associated with reduced alertness is the early afternoon. 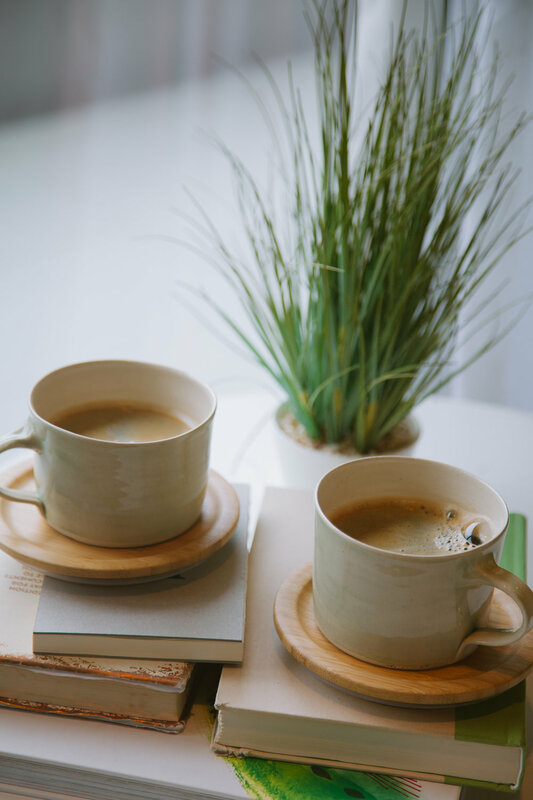 Again, studies involving ingestion of caffeine after lunch have shown that caffeine can reduce the post-lunch dip in alertness and sustained attention.”  While it’s also true these hormones dip during evening, it’s because your body is preparing for bed. If you compromise this natural response for too long, sleep becomes compromised. “400 mg of caffeine taken 0, 3, or even 6 hours prior to bedtime significantly disrupts sleep. Even at 6 hours, caffeine reduced sleep by more than 1 hour. This degree of sleep loss, if experienced over multiple nights, may have detrimental effects on daytime function.”  This cycle can easily spiral out of control, where caffeine dependency becomes likely. While coffee does have the perk of increased productivity, considering when to drink it helps you avoid potential restless nights. The caffeine in coffee also increases your metabolism. “Research on caffeine has demonstrated its role in increasing metabolic rate, energy expenditure, lipid oxidation, and lipolytic and thermogenic activities; all favorable components in regards to weight management and possible weight loss in humans.”  In fact, “A dose of 300 mg of caffeine/d will increase EE [Energy Expenditure]by about 79 cal/d.”  Losing 80 calories a day by itself is impressive enough, but combined with exercise, you can reap even more benefits. For endurance activity, “there is clear evidence that caffeine is an ergogenic aid for a variety of types of sports.”  You have greater pain resistance and more energy for longer periods. A concern is that endurance sports also require hydration. Despite coffee being a diuretic (meaning it’s dehydrating), “many studies that have examined caffeine supplementation and fluid balance have found that doses of caffeine that are within the range proven to be ergogenic do not alter sweat rates, urine losses, or indices of hydration status during exercise.”  Finally, “the literature is equivocal when considering the effects of caffeine supplementation on strength–power performance, and additional research in this area is warranted.”  The effects of performance on resistance training haven’t been studied as much, and what has is contradictory so far. Findings, instead, have been uncovering disease prevention associations with coffee consumption. Even regular drinkers of coffee show health benefits. More pointed research still needs to be conducted before these new findings are collaborated. Many scientists point to the cholesterol-raising effects of coffee as a drawback. Coffee contains kahweol and cafestol, components contributing to coffee’s bitter taste. They are more abundant in boiled and unfiltered coffee. Espresso also has high concentrations, but they’re not an issue due to the small serving size. Brewing method effects both cholesterol heightening components and antioxidant levels. Consider the differences in a standard drip brew with a paper or mesh filter and a French press. The cafestol and kahweol in coffee that raises cholesterol are fatty acids. “The French Press extraction showed the highest percentage, resulting from the ground coffee having relatively long contact with hot water, and was perceivable as a film of fat covering the walls of the glass jar. Filter coffee showed the lowest content of fatty acids, as the paper filter appeared to contain them.”  Additionally, “The extraction yield of cafestol was shown to be dependent on the brew mechanism and roasting time, with the lightest roast coffee prepared by French press or boiled preparations having the highest cafestol extraction yield.”  Finally, “Unfiltered coffee is a significant source of cafestol and kahweol, which are diterpenes that have been implicated in the cholesterol-raising effects of coffee.”  Thus, there’s more cholesterol-raising components in French press than in a drip brew method. Although the cholesterol-raising effects increase for French press, there are also more antioxidants that potentially serve to protect the body from the harmful effects of cafestol and kahweol, too. Conversely, the drip brew contains the harmful components but also traps many of the antioxidants in the filter. Cholesterol is only an issue depending on the method of brewing chosen. Brewing method is just one of many lifestyle choices that could account for the cholesterol-raising potential of coffee, though. Many of the drawbacks from coffee that have been demonized in the past don’t stem from coffee alone, but it’s relationship with other factors. Besides what brewing method you chose, other factors can include activity levels and whether you smoke. “Numerous surveys emphasize the importance of cofounding factors such as consumption of tobacco, alcohol, fats, use of contraceptives, obesity, and physical activity.”  In fact, a correlation with smokers and coffee drinkers was found. “There is a relationship between caffeine and smoking, with smokers consuming caffeine in far greater amounts compared to non-smokers... The metabolism of caffeine is accelerated by smoking and therefore greater intake of caffeine would be required to maintain preferred levels.”  And if you increase caffeine consumption, you are at risk of compounding harmful effects. Besides increased anxiety and reduced nutrient absorption, death, though rare, is also a concern. In 2007, one girl overdosed after having 14 espresso shots. So long as you remain in the trough of the J-curve (between 200-300mg/day) you shouldn’t have to worry about these effects, though. Another reason coffee has been demonized is because “caffeine has been associated with anxiety, nervousness, irritability, insomnia and even panic attacks.”  Are you a naturally tight-wound person? Or do you have more of a relaxed and calm demeanor? Surprisingly, this matters when it comes to coffee consumption. If you’re already a restless, anxious person, coffee may not be the best option for you. Additionally, “It is important to assess whether caffeine leads to mood problems when the person ingesting it already has a high level of anxiety. It has been claimed that some people abstain from caffeinated drinks because of the accompanying jitteriness and nervousness.”  If you’re already a restless, anxious person, coffee may not be the best option for you. Are you a coffee lover, or is tea or some other beverage your thing? Let us know in the comments. B. B. Fredholm, K. Bäettig, J. Holmén, A. Nehlig and E. E. Zvartau, Actions of caffeine in the brain with special reference to factors that contribute to its widespread use. Pharmacol. Revs., 1999, 51¸83−133. p. 124. D. Borota, E. Murray, G. Keceli, A. Chang, J. M. Watabe, M. Ly, J. P. Toscano and M. A. Yassa, Post-study caffeine administration enhances memory consolidation in humans. Nat. Neurosci., 2014, doi: 10.1038/nn.3623. p. 1. Smith, Andrew. "Caffeine." Diet, Brain, Behavior, 2011, 271-92. doi:10.1201/b11194-14. p. 274. Lorist, Monicque M., and Jan Snel. "Caffeine, Sleep, and Quality of Life." Sleep and Quality of Life in Clinical Medicine: 325-32. doi:10.1007/978-1-60327-343-5_33. p. 327. Smith, Andrew. "Caffeine." Diet, Brain, Behavior, 2011, 271-92. doi:10.1201/b11194-14. p. 279. Drake, Christopher, Timothy Roehrs, John Shambroom, and Thomas Roth. "Caffeine Effects on Sleep Taken 0, 3, or 6 Hours before Going to Bed." Journal of Clinical Sleep Medicine, November 15, 2013, 1195-200. doi:10.5664/jcsm.3170. p. 1198. M. A. Heckman, J. Weil and E. Gonzalez de Mejia, Caffeine (1,3,7-trimethylxanthine) in foods: a comprehensive review on consumption, functionality, safety, and regulatory matters. J. Food Sci., 2010, 75, R77−R87. p. R81. S. Rudelle, M. G. Ferruzzi, I. Cristiani, J. Moulin, K. Macé, K. J. Acheson and L. Tappy, Effect of a thermogenic beverage on 24-hour energy metabolism in humans. Obesity, 2007, 15, 349−355. p. 354. Burke, Louise. (2009). Caffeine and sport performance. Applied Physiology, Nutrition, and Metabolism. 33. 1319-34. 10.1139/H08-130. p. 1332. Smith, Andrew. "Caffeine." Diet, Brain, Behavior, 2011, 271-92. doi:10.1201/b11194-14. p. 275. Nawrot, P & Jordan, S & Eastwood, J & Rotstein, J & Hugenholtz, A & Feeley, Mark. (2003). Effect of caffeine on human health. Food Additives and Contaminants. 20. 1-30. p. 22. B. B. Fredholm, K. Bäettig, J. Holmén, A. Nehlig and E. E. Zvartau, Actions of caffeine in the brain with special reference to factors that contribute to its widespread use. Pharmacol. Revs., 1999, 51¸83−133. p. 125. Wachamo, Hailu Lire. "Review on Health Benefit and Risk of Coffee Consumption." Medicinal & Aromatic Plants 06, no. 04 (2017). doi:10.4172/2155-9821.1000301. p. 5. J. V. Higdon and B. Frei, Coffee and health: A review of recent human research. Crit. Rev. Food Sci. Nutr., 2006, 46, 101−123. p. 116. G, Messina, Zannella C, and Monda V. "The Beneficial Effects of Coffee in Human Nutrition." Biology and Medicine 07, no. 04 (2015). doi:10.4172/0974-8369.1000240. p. 4. Fukushima, Yoichi, Takeshi Tashiro, Akiko Kumagai, Hiroyuki Ohyanagi, Takumi Horiuchi, Kazuhiro Takizawa, Norie Sugihara, Yoshimi Kishimoto, Chie Taguchi, Mariko Tani, and Kazuo Kondo. "Coffee and Beverages Are the Major Contributors to Polyphenol Consumption from Food and Beverages in Japanese Middle-aged Women." Journal of Nutritional Science 3 (2014). doi:10.1017/jns.2014.19. p. 1. Sanlier, Nevin, Azize Atik, and Ilker Atik. "Consumption of Green Coffee and the Risk of Chronic Diseases." Critical Reviews in Food Science and Nutrition, 2018, 1-13. doi:10.1080/10408398.2018.1461061. p. 6. Gloess, Alexia N., Barbara Schönbächler, Babette Klopprogge, Lucio D'ambrosio, Karin Chatelain, Annette Bongartz, André Strittmatter, Markus Rast, and Chahan Yeretzian. "Comparison of Nine Common Coffee Extraction Methods: Instrumental and Sensory Analysis." European Food Research and Technology 236, no. 4 (2013): 607-27. doi:10.1007/s00217-013-1917-x. p. 614. Zhang, Chen, Robert Linforth, and Ian D. Fisk. "Cafestol Extraction Yield from Different Coffee Brew Mechanisms." Food Research International 49, no. 1 (2012): 27-31. doi:10.1016/j.foodres.2012.06.032. p. 27. Choi, Sukyoung, Soohan Jung, and Kwang Ko. "Effects of Coffee Extracts with Different Roasting Degrees on Antioxidant and Anti-Inflammatory Systems in Mice." Nutrients 10, no. 3 (2018): 363-76. doi:10.3390/nu10030363. p. 373. Wolska, J., Katarzyna Janda, K. Jakubczyk, M. Szymkowiak, D. Chlubek, and I. Gutowska. "Levels of Antioxidant Activity and Fluoride Content in Coffee Infusions of Arabica, Robusta and Green Coffee Beans in According to Their Brewing Methods." Biological Trace Element Research 179, no. 2 (2017): 327-33. doi:10.1007/s12011-017-0963-9. p. 332. Opitz, Sebastian E.w., Bernard A. Goodman, Marco Keller, Samo Smrke, Marco Wellinger, Stefan Schenker, and Chahan Yeretzian. "Understanding the Effects of Roasting on Antioxidant Components of Coffee Brews by Coupling On-line ABTS Assay to High Performance Size Exclusion Chromatography." Phytochemical Analysis 28, no. 2 (2016): 106-14. doi:10.1002/pca.2661. p. 113. Debry, Gérard. Coffee and Health. London: John Libbey, 1994. p. 351. F Brice, Carolyn & Smith, Andrew. (2002). Factors Associated with Caffeine Consumption. International Journal of Food Sciences and Nutrition. 53. 55-64. p. 63. D. B. Panagiotakos, C. Pitsavos, C. Chrysohoou, P. Kokkinos, P. Toutouzas and C. Stefanadis, The J-shaped effect of coffee consumption on the risk of developing acute coronary syndromes: the CARDIO2000 case–control study. J. Nutr., 2003, 133, 3228−3232. p. 3232. Smith, Andrew. "Caffeine." Diet, Brain, Behavior, 2011, 271-92. doi:10.1201/b11194-14. p. 273. Wolde, Tsedeke. (2014). Effects of caffeine on health and nutrition: A Review. Food Science and Quality Management 30. January 2014. 59-65. P. 63. Favrod-Coune, Thierry, and Barbara Broers. "The Health Effect of Psychostimulants: A Literature Review." Pharmaceuticals 3, no. 7 (2010): 2333-361. doi:10.3390/ph3072333. pp . 2336-2337. Garattini, Silvio. Caffeine, Coffee, and Health. New York: Raven Press, 1993. pp. 284-285. Smith, Andrew. "Caffeine." Diet, Brain, Behavior, 2011, 271-92. doi:10.1201/b11194-14. pp. 284-285. The Dairy Debate: A Healthy Essential or a Risky Pleasure?